Anyone who hasn’t sensed a mood change in this country since the 2008 financial meltdown is either ignorant or in denial. Millions of Americans fall into one of these categories, but many people realize something has changed – and not for the better. 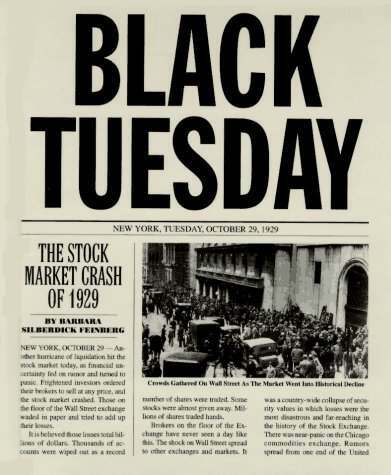 The sense of pure financial panic that existed during September and October of 2008 had not been seen since the dark days of 1929. Our leaders used the initial terror and fear to ram through TARP and stimulus packages that rewarded the perpetrators of the financial collapse rather than helping the middle class who lost 8 million jobs, destroyed by Wall Street criminality. The stock market plunged by 57% from its 2007 high by March 2009. What has happened since September 2008 has set the stage for the next downward leg in this Crisis. The rich and powerful have pulled out all the stops and saved themselves at the expense of the many. Despite overwhelming proof of unabashed mortgage fraud, rating agency bribery, document forgery on a grand scale and insider trading based on non-public information, the brazen audacity of Wall Street oligarchs is reminiscent of the late stages of the Roman Empire. The actions of the governing elite have provoked the darkening mood creeping across the land. The rise of the Tea Party in 2009 was fueled by anger over the bank bailouts, out of control federal spending and ever increasing taxes. The anger spilled over into town hall meetings, as Congressmen felt the wrath of public dissatisfaction. 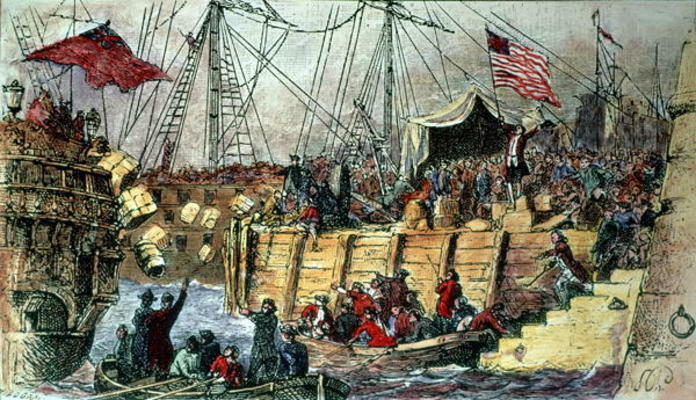 The fury propelled Tea Party Republicans to being elected in large numbers in 2010. But the movement was hijacked by the Republican establishment and defanged. As 2011 progressed, with Wall Street continuing to pillage the American middle class, the Occupy Movement spread to cities across America and around the world. The movement, led by Millenials, claims that mega-corporations and Wall Street manipulate the world in an unbalanced way that disproportionately benefits a super wealthy minority and is undermining democracy. They have shone a light upon the fact the 1% has used their wealth and power to plunder the national treasury, while impoverishing the 99%. The audacity of the 1% was on display for all to see when former Goldman Sachs CEO and former U.S. Senator Jon Corzine absconded with $1.2 billion of his customers’ money and continues to hide it in the vaults of his fellow robber baron Jamie Dimon at J.P. Morgan. To this day, no one has been jailed for this heist or any of the thousands of other crimes committed by the Wall Street titans. These psychopaths will not be satisfied until nothing remains of our country but a barren desert. A few weeks ago I watched The Grapes of Wrath movie for the first time in many years. The novel was written by John Steinbeck during the last Fourth Turning. It is as powerful today as it was in the 1941. It perfectly captures the mood of the country during the Great Depression. The message of the working class being exploited and manipulated by wealthy landowners resounds today. The Joads only sought an opportunity for a job, their own land, simple human dignity, and the chance for a better future. Wall Street has replaced the wealthy landowners as the exploiters of the working class. Steinbeck saw the Federal Government as a solution during the 1930s, but they are a major part of the problem today, as politicians have been captured by corporate and special interests. Their solutions do not benefit the average middle class American. The feelings about our government and political system is reflected in Suzanne Collins’ Hunger Games novel, which captures the vein of government brutality, oppression of the working class, excessive wealth inequality, and the vapid shallowness of our American Idol culture. The Hunger Games was written in 2008 and the movie version has become a worldwide sensation. The immense divide between the wealthy ruling class, living an obscenely decadent lifestyle, and the exploited working class on the verge of starvation, is portrayed in a cruelly sadistic manner. The fact that it is appealing to Millenials and all generations says much about the changing of attitudes in the last four years. Hunger Games will be viewed as the modern day Grapes of Wrath by future generations. But they have solved nothing. In fact, they have exacerbated the problem areas of debt, civic decay and global disorder with their “solutions”. Our leaders have added $5.6 trillion to the National Debt; the Federal Reserve tripled their balance sheet by taking on $2 trillion of Wall Street toxic debt; the Federal Government assumed trillions in new debt by taking over Fannie Mae, Freddie Mac and Sallie Mae; and real GDP went up by a mere $103 billion (.8%) between the 4th quarter of 2007 and the 4th quarter of 2011. Rescuing the 99% was never the focus of their solutions. It was to save the bankers and wealthy investors (1%) who took the world destroying risks and should have borne the losses of their risk taking. The oligarchs have been wildly successful in this effort. The stock market has doubled from its lows. Borrowing at 0% from the Federal Reserve has done wonders for banker bonuses. Global disorder increases by the day, as politicians and bankers force austerity on their citizens, while continuing to harvest billions in profits and bonuses still waging wars of choice, further enriching the peddlers of debt and the peddlers of death (military industrial complex). The Great Depression lasted from 1929 until 1940. The GDP of the country actually grew by 80% between 1933 and 1940. 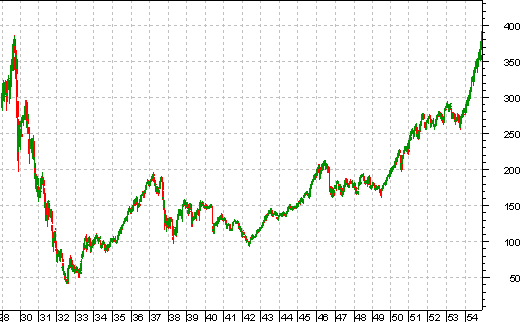 The stock market soared by 100% from the 1932 low to its 1933 high. It then soared another 100% from 1934 through 1937. Despite these fabulous economic statistics and investment riches scooped up by the 2.5% of the population that owned stocks, they still call this time period the Great Depression. With unemployment ranging from 15% to 25% during this entire time frame, the common man suffered greatly. There was no recovery for the 99%. The net worth of the 99% is highly dependent on the value of their homes and their ability to increase their annual wages. Home prices have fallen 34% from their peak and continue to fall, recently reaching 2002 levels. Real median weekly earnings are lower than they were in 2003 and have fallen 3% since the economy supposedly entered its recovery in December 2009. Gas prices have doubled since early 2009. The 1% rejoices as they treat oil as an investment in their diversified portfolio. The 99% suffer as the average household is spending $2,500 per year more to fill up their vehicles. Food prices are up 15% to 25% in the last three years, even using the manifestly manipulated BLS figures. The downward spiral of societal trust is well founded. The monied interests have captured the political process. The regulated have captured the regulators. Wall Street has always controlled the Federal Reserve. Corporations and the wealthiest among us select the politicians that will best serve their interests. The governing elite of psychopathic bankers, corrupt politicians, and powerful mega-corporations create crises, then save us from the crises they created, while accumulating more control, wealth and power. This perpetual swindle has been going on for decades and has reached its zenith as it did during the last Fourth Turning. Income inequality has reached the extreme levels last seen in the 1930s. The capitalism storyline has grown old and tired. Complete systematic capture is the reason for those at the top reaping all the benefits of our dysfunctional economic system. Here we stand, three and a half years since the catalyst of this Crisis. What event or events will produce the regeneracy stage of this Fourth Turning and when can we expect its arrival? I’ll try to make some educated guesses in Part Three of this series.